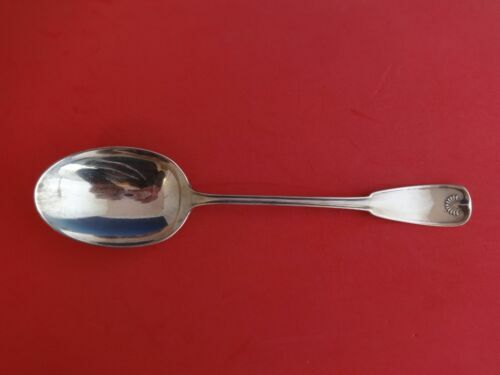 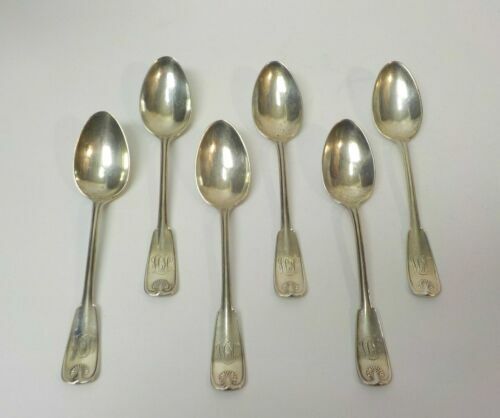 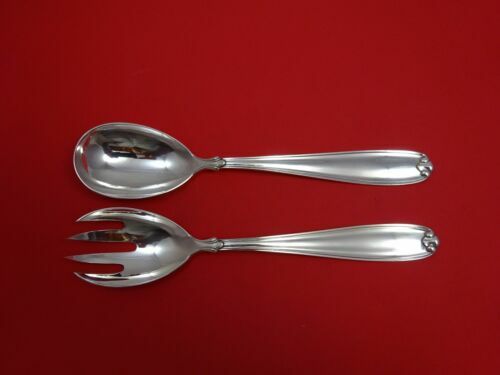 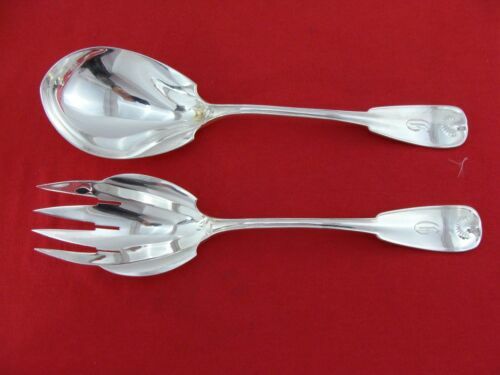 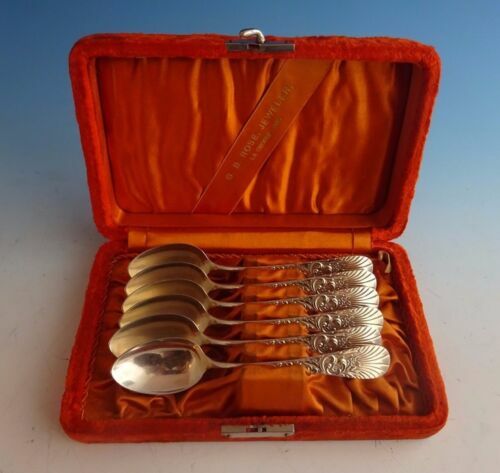 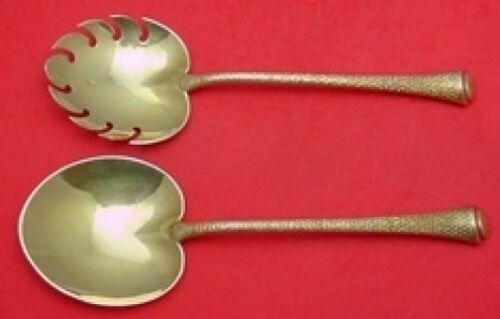 $9.95 (1 bid) LOT OF 3 STERLING SILVER SOUVENIR SPOONS, OREGON, NEB.. MT VERNON, VA.
$375.0 Set of 5 Palm Beach 1900 Gorham Sherbert Spoons Sterling Silver Gold Wash 5 5/8"
$989.0 Palm Beach by Gorham Sterling Silver Salad Serving Set Vermeil 8 1/2"
$389.0 Palm by Tiffany & Co. Sterling Silver Individual Asparagus Tongs 4 7/8"
$209.0 Palm by Tiffany & Co. Sterling Silver Cream Soup Spoon 6 7/8"
$389.0 Palm by Tiffany & Co. Sterling Silver Vegetable Serving Spoon 9 3/4"
$389.0 Palm By Tiffany and Co. Sterling Silver Dinner Knife SP Blade 9 3/4"
$259.0 Palm By Tiffany Rare Copper Sample Tomato Server One of a Kind 8"
$389.0 Palm by Gorham Sterling Silver Fish Serving Fork Bright-Cut 9 1/8"
$389.0 Palm by Tiffany & Co. Sterling Sugar Sifter 5 7/8"
$209.0 Palm by Tiffany & Co. Sterling Silver Fish Fork 6 7/8"
$189.0 Palm By Tiffany and Co. Sterling Silver Dinner Spoon 8 1/2"
$289.0 Palm By Tiffany Sterling Silver Roast Carving Knife 14 3/4"
Buy: $275.0 12 TIFFANY STERLING SILVER TEA SPOONS PALM 1871 - MONO: “B” NEW LOWER PRICE !!! 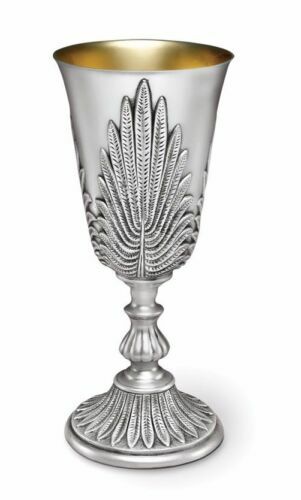 $209.0 Palm By Tiffany Sterling Silver Salad Fork Wavy Tines 6 1/2"
$209.0 Palm By Tiffany Sterling Silver Salad Fork Goldwashed 4-tines 6 5/8"
$975.0 Galmer Silver Company Sterling Silver Water Goblet "Palm"
$489.0 Palm By Tiffany and Co. Sterling Silver Fish Serving Fork 5-tine 8 3/4"
$619.0 A Sterling Soup Ladle in the Palm Pattern, #1871, by Tiffany. 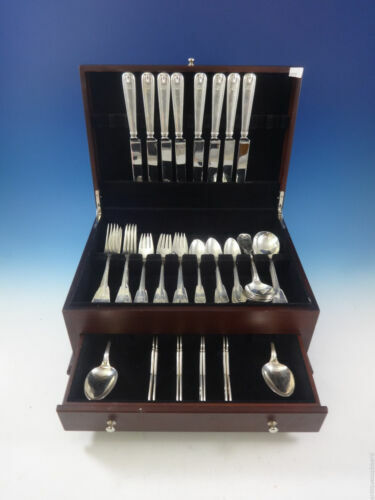 $389.0 Palm by Tiffany & Co. Sterling Banquet Knife 10 3/4"
$359.0 Palm by Gorham Sterling Silver Ice Cream Server Bright Cut 10"
$289.0 Palm by Tiffany & Co. Sterling Silver Gravy Ladle 7"
$209.0 Palm by Tiffany & Co. Sterling Salad Fork 6 1/2"
$259.0 Palm by Tiffany & Co. Sterling Silver Nut Spoon 4 1/4"
$259.0 Palm Beach By Buccellati Sterling Silver Master Butter Knife 7 3/4"
$289.0 Palm by Tiffany and Co Sterling Silver Cold Meat Fork Splayed Tines 9"
$189.0 Palm by Tiffany & Co. Sterling Silver Regular Knife Silverplate Blunt 9 3/8"
$289.0 Palm by Tiffany & Co. Sterling Silver Cold Meat Fork 8 5/8"
$289.0 Palm by Tiffany & Co. Sterling Silver Sugar Tong 4 3/8"
$149.0 Palm by Tiffany & Co. Sterling Silver Place Soup Spoon 7 1/4"
$389.0 Palm By Tiffany and Co. Sterling Silver Dinner Knife French 10 1/8"
$689.0 Palm by Tiffany & Co. Sterling Silver Cracker Scoop 9 1/2"
$189.0 Palm by Tiffany & Co. Sterling Silver Mustard Ladle GW Original with Spout 5"
$889.0 Palm by Tiffany & Co. Sterling Silver Crumber 11 1/4"
$159.0 Palm Beach by Buccellati Sterling Silver Dinner Fork 4-Tine 8"
$159.0 Palm By Tiffany and Co. Sterling Silver Mustard Ladle Original 3 1/2"
Buy: $49.0 The Everglades Club Palm Beach Backgammon Tray Vintage Silver Plate NICE! 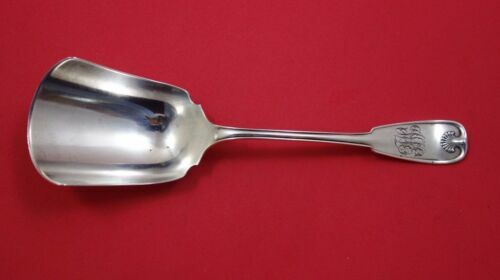 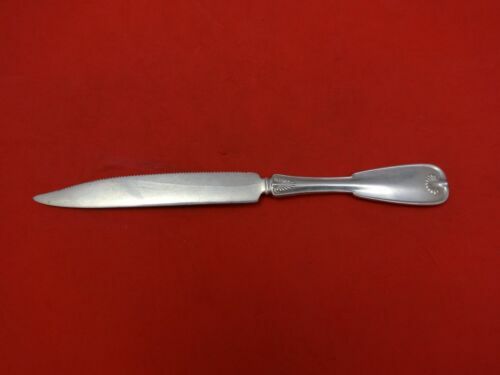 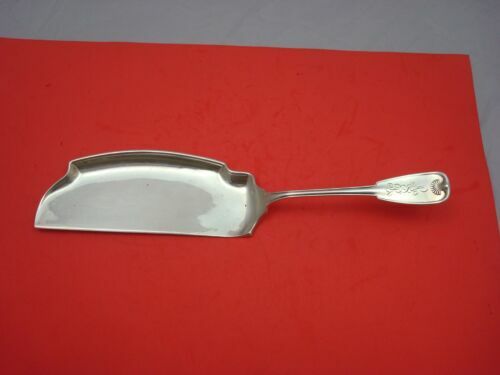 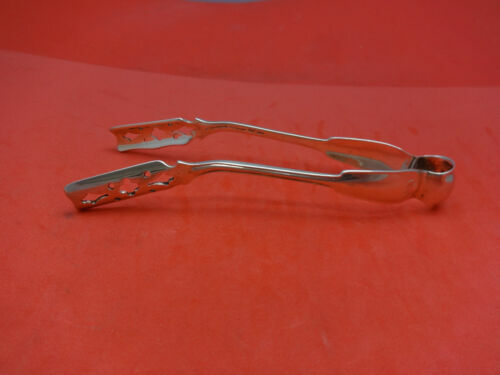 $189.0 Palm by Tiffany & Co. Sterling Silver Regular Knife Blunt 9 1/4"
$489.0 Palm Beach By Buccellati Sterling Silver Pie Server FHAS 10 3/4"